In the new frontier of Digital Marketing, the ability to automate complex sales chains can mean the difference between a tremendous boost to your business, and a mild success. 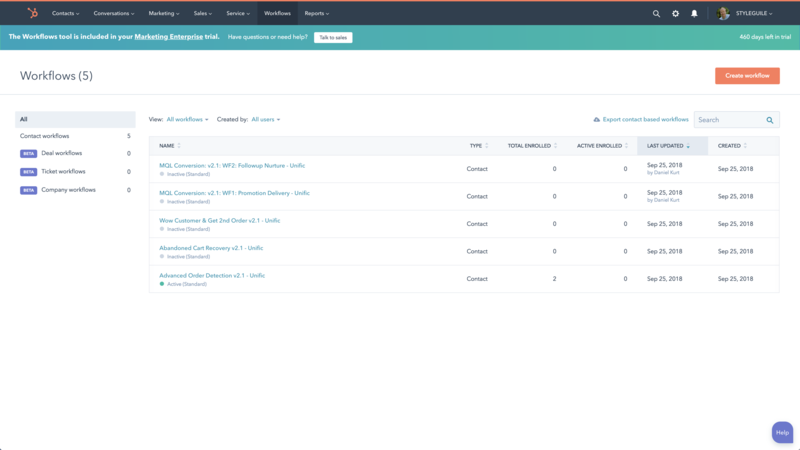 HubSpot not only lets you automate large portions of your sales channels, but has a level of customer data and insight that is unprecedented, allowing you to create automated campaigns with a level of specificity that was previously unheard of. And in order to do that, you need to master two portions of the platform: lists and workflows. Each of these lists are designed to utilize your data to seek out your Top Customers—the people who you should put most of your muscle behind. For examples, with our At-Risk Best Customers, you can immediately create a workflow designed to reign in people who’ve spent a lot with your business who are on the verge of leaving or going to a competitor, dealing with the problem before things get out of hand. Each list we create has a specific purpose like this in order to save you time and retain your customers. With HubSpot, you can automatically create lists based on certain customer characteristics ( age, gender, etc), and they allow you to create your own based on your specific needs. The goal is to use these groups to develop far more targeted, personalized campaigns against these customers. While HubSpot’s auto-generated lists have some use, you’ll find that the most useful are the ones that you create yourself, as they can be built to perfectly match the needs of your company. More importantly, than can be incredibly useful when paired with a solid, specific workflow. Workflows are the bread and butter of your marketing strategy in HubSpot. 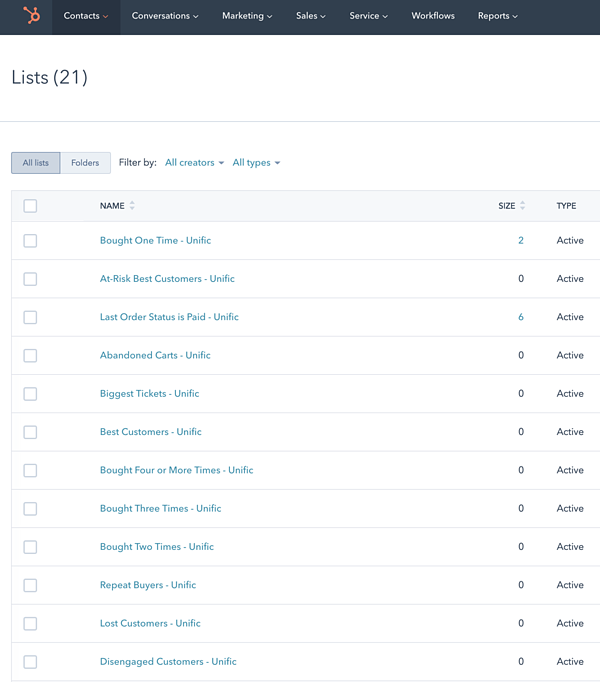 Once you’ve segmented customers into useful list, you can create an automated workflow--a series of directed emails and communications--to induce very different types of behaviors. Many platforms allow some form of automation, but almost none do it with the vast, rich data that HubSpot has on your customers. Different segments require different workflows, which often include custom content, scheduling, and more to most effectively work. Abandoned Cart Recovery Workflow: This is designed to help get someone who abandoned their cart to come back and finish their purchase in a series of 3 or more emails. Wow Customer & Get 2nd Order Workflow: This triggers shortly after a first purchase, and are designed to give the customer some useful content that delights them, while pushing them towards a 2nd order that works pairs with what they first ordered. MQL Conversion Workflow: This is designed to get a qualified lead to make the first purchase, and is triggered when someone opts in to one of your funnels. : This one is designed to easily send a promotion to a qualified customer based on criteria you determine. : A less sales oriented workflow designed to keep you on the customer’s radar by following up to them with special information, deals, etc. Advanced Order Detection: Occurs when Total Number of Orders is known and paid for. Designed to help figure out the next time a customer will need an order, and perfect for businesses where customers need a refill of some sort. 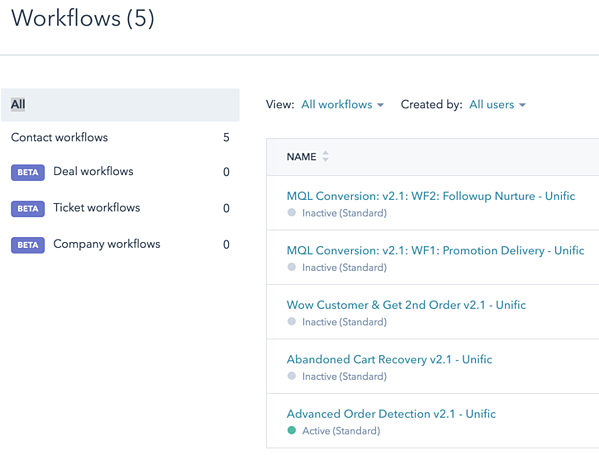 To get you started, a workflow every ecommerce business should have is a New Leads workflow which you could easily create using Unific’s Last Order Date RFM Field. The goal of this workflow would be to take a first time buyer, and convince them to buy something else with your company within a certain allotment of days. Using your segments, you will be able to see that Top Customers tend to make a second purchase within a certain timeframe--let’s say 40 days as an example ( but your timeframe may be different). For this workflow, you would create a targeted campaign of content to be sent over a few weeks with the goal of making a customer make one additional purchase within the 40 days of their first. If they bite, it’s a good indicator that they could turn into one of your best customers, and if they don’t, it can help you move them into a different, slightly less important bucket for the future. Typically this type of campaign would use an offer code to get a discount on a complimentary product or service to what the customer first bought. In our HubSpot Ecommerce Playbook, we also touch on dozens of other important features of HubSpot. We cover everything from using automated bots, to setting up video sales funnels, to customized segmentation your business needs, and plenty more. If you’ve been looking for a guidebook to get your ecommerce in shape on HubSpot, this can help you get there.